Energetic Cellular rebuilding effect within minutes! 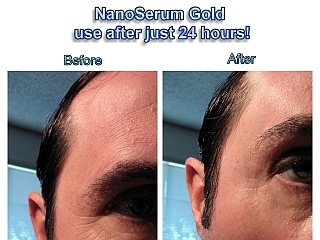 An energy bonded nano colloidal gold and copper healing breakthrough, this extraordinary cream consistently replenishes skin's energy using HydroPhasic nanotechnology to safely deliver the power of electrified 24 karat nano gold particles right into the cellular level of your skin. By promoting advanced cell metabolism and allowing the body to hyper-stimulate collagen production, skin retains optimal health and youthful vitality. NanoRenew is an effective night or day rejuvenation face, neck and hand lotion. Each jar is infused with million's of positive charged Nanoscopic particles of real 24K NanoGold, NanoSilver, NanoZinc and NanoCopper. Nano Particles are the best way to rejuvenate tired skin at the cellular level all with the help of the <10 nanometer colloidal particles this cream will deliver to your skin. Nanoparticles of 24-karat gold are bound to organic aloe and pure silk Nanoscopic elemental fibers, a natural protein that acts as a moisturizing, antioxidant, and anti-inflammatory age -defying formula. Through our patent pending process (which we discovered and published our findings in 1996), these elements reach the cellular level where they support the skin to respond as an ultimate healing and preserving force. Sorry, NanoRenew is only sold to large volume users, Dealers and Stores at this time, minimum order 24 + jars. For those that want to sample a jar, I always have a few jars left over from a recent dealer batch. Please email Marc at organixtech@gmail.com if you want a jar. They are $25.00 each, plus shipping. We ship Economy or Priority Mail for most purchases. This product is approved for Worldwide Shipment at this time! Packaging: 2 oz. Amber or Cobalt Blue PET Jar, thin wall (default), thick wall available. Jar Lid 58-400 foam lined, black plastic (default) or metal gold matte finish. NanoRenew Colloidal Mineral lotion helps keep face, neck and hands looking and feeling more hydrated and energized. Each jar of NanoRenew goes through a multiple step production process which includes electrically imprinting and final infusion of our colloidal minerals to give you a true nanotechnology delivery system. We only use real Nanoscopic (under 10nm) Nobel particles that each are imprinted with a actual electrical charge before joining our premium lotion base. The charged Colloidal particles are simply a better way to transport colloidal minerals into and beneath the epidermis in a safe and effective way, all in a renewed effort to help support and rejuvenate our largest organ, the skin. NanoRenew is a lightweight lotion, not a heavy face cream. One or two applications of NanoRenew every night supports skin healing and helps promote superior hydration and oxygenation effect. 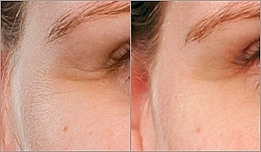 After a few months of use, most users report that their NanoRenew regimen has helped to reduce fine lines around eyes and on the users forehead, all without adding damaging chemicals to your skin. Through the use of a quality non scented premium cosmetic base, we infuse each 2 oz. jar with millions of positively charged Nano Particles of the following Nobel minerals: 24k Gold, .9999 Silver, .999 Zinc and .999 Copper. Both Natural and Organic ingredients are combined with sensible preservatives that help to stabilize each jar of NanoRenew for normal use at room temperature for about 12 months. 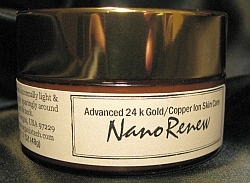 NanoRenew’s active ingredients are 90% premium lotion base, plus 5% pure steam distilled water and 5% makeup of the following Nanoscopic Minerals of 24k Gold (30ppm) NanoSilver (30ppm) NanoZinc (30ppm) and age defying NanoCopper (10ppm), all minerals which support natural skin cell repair synthesis. NanoRenew is fragrance free and contains no coloring additives. Premium lotion base Ingredients include Pure Steam Distilled Water, Isopropyl Palmitate, Propylene Glycol, Glyceryl Sterate, Isononyl Isonanoate, Glycerin, Lanolin Oil, Myristyl Myristate, Stearic Acid, Carbmer, Methylparaben, Diazolidinyl Urea, Iodopropynyl Butylcarbamate, Disodium EDTA, Allantoin, Triethanolamine, Sorbitan Sterate, Polysorbate, Dimethicone, Propylparaben, BHA Tenox, Aloe Vera Gel, Vitamin A, Vitamin D, Tocopheryl Acetate, Vitamin D and E.